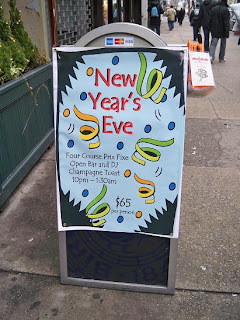 Still need last minute ideas for New Year's Eve? Don't fret because there's lots going on in Astoria. Just take a look at this sampling of New Year's Eve specials--and this is just the tip of the iceberg! Enjoy the evening at Mojave where $65 per person will get you a 4-course dinner prixe-fixe, an open bar, a DJ and a midnight champagne toast. Mojave - 22-36 31st Street, Astoria. 718.545.4100. Have a fun and happy New Year Astoria!